Launches MINI Deutsche Motoren, its second dealership in Delhi. MINI India announced the opening of Deutsche Motoren, its second dealership in Delhi. The new MINI Deutsche Motoren dealership is located at Mohan Co-operative Industrial Estate, Mathura Road, New Delhi. The dealership will display the MINI Hatch, MINI Convertible and MINI Countryman. The dealership is headed by Yadur Kapur, Executive Director, Deutsche Motoren. 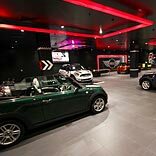 The new MINI dealership interior at Deutsche Motoren has been uniquely designed to replicate the modern city feel in an indulging, inviting and interactive format. MINI Deutsche Motoren dealership will offer a display area of over 3200 sq ft. and a five car display set-up. The multi functional architecture will also have a MINI Lounge, MINI Lifestyle Collection and MINI Accessories on display. With MINI Financial Services, the customers will be able to avail attractive finance and insurance options. In addition, MINI Financial Services will also offer a comprehensive insurance package: MINI Smile (similar to BMW Secure) which is a value-add for MINI customers over and above their basic motor insurance.